Are you looking to build your own Website/Blog? Choose which website building platform. The best choice is WordPress. The first step you need to select is the website building platform. There are so many CMS (Content Management Systems) are available to choose from. Finding out the right platform is the first task. Content management systems are the best platform to make a website without any technical knowledge. Some platforms require you to know a little bit of HTML/CSS or any other coding languages. If you are a beginner WordPress will be your best choice. WordPress, Blogger- Which one is best for you? These are the three main content management platforms. Most websites are run by WordPress worldwide. As you can see above half of the websites on the internet are running on WordPress website platform. WordPress is the number one platform in the content management system. Most of the people are using WordPress and it’s easy to use. We recommend you to choose WordPress. This is very powerful and you can easily run most types of sites. WordPress is the trusted platform for many of the busiest websites in the world. So your first task is complete and we can move to the next step. As I said WordPress is free to make a website. They provide you with a WordPress domain name also. Their hosting service is really slow and that will affect your website ranking on google. The WordPress domain name does not look like a professional one. So we have to find out a good domain name and affordable web hosting service. We recommend you to choose Bluehost for your hosting provider. They are giving domain name free for one year. you can select (.com, .net, .org) domain names for free. Bluehost is the most popular web hosting company. They are offering different hosting services for your needs. Their basic plan starts at $3.95/month. This is very cheap and affordable hosting and you get a free domain too. Let’s talk about hosting later and we move to select a domain name now. What type of Domain name should I pick? Domain names are an important factor for any kind of website. If you are making a business website, your domain name should match your company name. There are so many domain extensions are available nowadays. The most popular and best-ranking domain names are (.com, .net or .org) domains. Our best advice is to go with these domains. These are commonly used and this will help better result on your website in google ranking. What to do If you already have a Domain Name? Nothing to worry if you already have a domain name. you can give your domain address and choose a hosting plan from Bluehost. If you have both domain name and a web hosting, please follow me from step three and set up your website. Which one is the best Bluehost Web Hosting Plan? Bluehost has three affordable shared hosting plan. select your plan according to your needs. If you are a beginner our advice is to start with a plus or prime plan. Now, the plus and prime plan cost only $5.95/month and you will get some additional features than the basic plan. All the plans come with a free domain. Are you ready to make your website now? When you get a new hosting account from Bluehost, you will have an option for one-click WordPress install. Let’s see how to do a WordPress one-click installation. Once you finish the installation process you can go to the WordPress dashboard. So many free WordPress themes are available. After completing theme installation you can easily customize the theme by selecting customize option below the themes in the dashboard. If you have a premium theme, that also you can upload and customize. Anytime you can change your theme. Changing themes won’t change your previous posts, pages, and contents. After customizing the theme just complete adding pages and content to your site. All you need to do is just go to the dashboard and select pages. Once adding all the pages just go to the Appearance, then menu option and add pages to the main menu and sub-menu, where you want to keep your pages. The next step is to install the plugins. “Plugins” are the extensions to expand WordPress capabilities. This will add features and functions to your site. Simply we can say, they are shortcuts to your site to do anything you want. So many free plugins are available. Select which one you want to your website. Do not add all kind of plugins. some of them may slow down your website. only select and install what you really need it. Few of the useful plugins are listing below to help you to save your time. you are ready to launch your website now. If you have followed these steps you now have a fully functioned WordPress website. 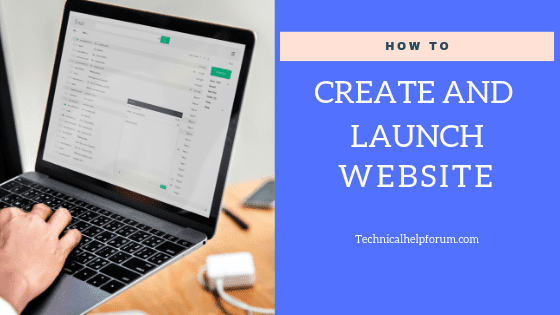 Just click the “launch” button then your site will be live. Anytime you can customize your website and make some changes if required. Always try to add contents to your site and keep it live.